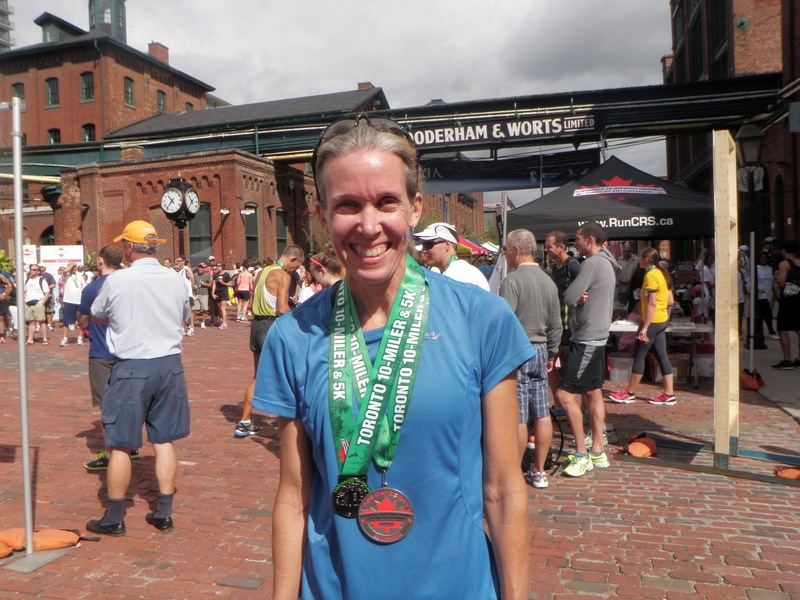 The Toronto Ten Miler is a race that seems to run itself. I’ve run it for 3 years now and, each year, I can only say positive things about it. Organized by Alan Brookes of the Canada Running Series, The Toronto Ten Miler (formerly, the Acura Ten Miler) draws close to two thousand runners in the middle of the summer – testimony of its high quality. This year, my husband helped with the water stations in the middle part of the course, which started in Toronto’s Distillery District and went through Tommy Thompson Park, so we had to be at the race site at 6:45. This meant that we had to leave home just after 6:00 a.m and I had to hang around for close to two hours before the 8:30 start. And, as good fortune had it (and, yes, there is sarcasm in my tone), we had to park the car closer to his location, which was over 3K from the start line. Afraid that I’d fall asleep in the car and wake up at 8:32 cursing that I slept through the start, I headed over shortly after he left me. I turned up Parliament Street, where volunteers were just beginning to set up the finish line. If for no other reason (and, believe me, there are others), The Toronto Ten Miler wins hands-down in the toilet facilities. I found an open public washroom in the distillery district and used that first. Then, before my warm-up, I visited the many porta-potties outside – no line=up and reasonbly clean; after all, it was still early. After my warm-up, with only 20 minutes before the start, I decided to risk standing in line one more time to empty my nervous bladder (which is always noisy) and was able to. Any race that has enough porta-potties is definitely a well-organized event. Also quick-moving was the baggage check; lots of volunteers were there to make sure that runners didn’t have to wait. In fact, I had time to go back to toss my puffer in my backpack 10 minutes before the start. Time-wise, my race goal was to run sub-72. I felt I could do it as everything had been going well in training. My last tempo on the Wednesday before was a bit weak but I still thought I could pace myself towards a new PB and, hopefully, a top Master’s finish. The plan was to go out at a 4:20 kilometre, something I’ve never done in a longer race as I’m more of a start slow (4:30 per km) and pick it up kind of runner. But we felt that I needed a fast start “to give me some room”. So I went out at 4:20 and held the pace for a while. My friend, Arma, and I were neck and neck for the first 5K; I’d pull ahead, then she would, then I would….I made sure that I grabbed Gatorade on the run rather than walk through the aid stations, worried that she would pull ahead of me and I wouldn’t catch her. By the time we got to 6K, I surged ahead and started to work to keep the space between us. But I knew my pace was slowing down and I worried that she and others would catch me in the end. Between 6K and 10K, I threw in a few more surges to try to get ahead. Dave was on his bike in that section of the course and when he saw me around the 9K mark, I only had two terse words for him: Go AWAY. I wanted to focus on running, not on telling him how I was feeling and hearing about who was ahead or behind. Dave wasn’t bothered by this at all as I’ve thrown more colourful phrases at him in previous races. So off he went, leaving me on my own. I had caught a few more gals since the 6K mark but was starting to hurt. Then, around 11K, I made that one fatal error: I walked through the water station. This was something that I had been working on not doing for months but my thighs were tiring. I thought about whether compression shorts would have made a difference and I agonized about whether the long walk to the start was starting to wear me down. As I passed the second last table, I started to run again and made a point of pushing hard past the next station without stopping. There was one women in sight that I still wanted to try to catch; I still wanted that sub-72 finish. But I did it again. Once I got to the last station, I slowed to a walk again, drank Gaorade, gagged, drank some more and turned the power up a notch. There were less than 2K to run, and I had figured that I might just squeak in under 72 minutes. I kept pushing along the same route that I had walked 2 hours earlier, Turning up Parliament Street, the finish line seemed much closer than I remembered and I immiediately wished that I hadn’t walked through that last station. I went through in 72:25. Was I happy with my time? Not exactly. I missed my goal. But I was happy with my race. I ran a PB. I ran through most of the stations while taking in fluids (and ran past some without fretting) and I’ve never been able to do that. I ran the first 5K as planned. I threw in a few surges. A few men thanked me for pulling them through the race. I was complimented by a former running mate, who has seen me run for more than 20 years, and he was shocked when he saw my finish time. Where did I go wrong? I’m still not at the “go balls out” stage in my racing; I’m giving up on myself when I don’t need to be. Confidence. And, while I’m getting better with aid stations, I still need to work on them. I don’t drink during training (unless it is more than 10 miles) so I shouldn’t need that much fluid during a race. Grabbing Gatorade or water has simply become a habit and I need to reduce the number of times that I do that. In the end, my final time was 72:25 – close to what I wanted but not what I wanted. But I did finish as one of the top Masters; another 5 seconds would have placed me first in my age group. On the plus side, I was second in my age group (45-49) and was the oldest of the nine award winners the 40-49 group. I plan to go back next year. I have goals – clear, definitive goals. Look out! You are way too hard on yourself. I think you ran a great race! You are one strong runner.